A new FCC filing suggests that there is a new Sonos system in the works - a home theater system which comes equipped with Alexa. Sonos has been busy buddying up with Alexa, having made its speaker line-up compatible with Amazon's voice assistant. It also embedded Alexa into the Sonos One, its latest smart speaker. Couple this with hints that it will have voice control and come equipped with an HDMI slot (previous incarnations opted for an optical out) and what you have is a system that has the potential to pump out Dolby Atmos - and we love living in a Dolby Atmos world - and other such audio loveliness. 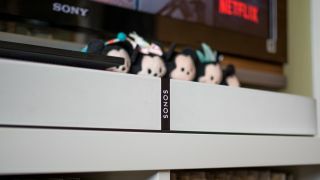 Personally, we would love to see another iteration of the Sonos Playbar. The speakers in the Playbar were majestic, but its lack of HDMI left us a little frustrated - add this and Alexa, and it could be a fantastic product. Given the Sonos Playbase is only a few months old, we can't see that getting a makeover. Or it could be that Sonos has a wholly different speaker setup under its smart sleeve?